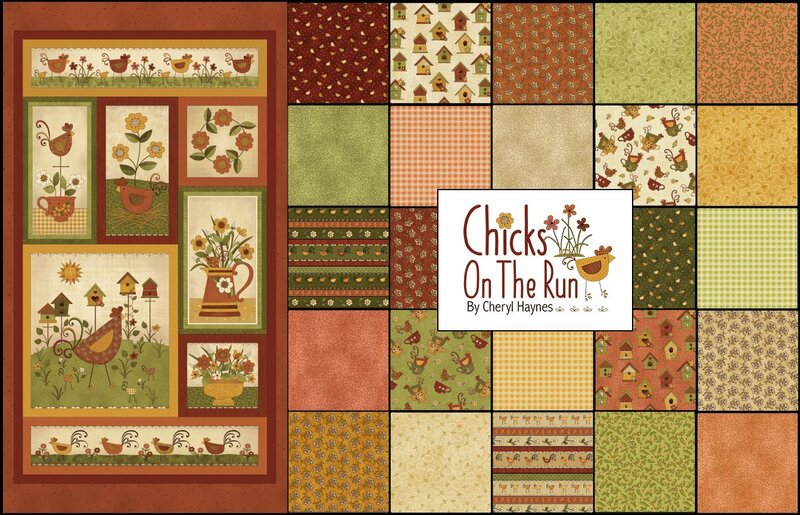 Chicks on the Run by Cheryl Haynes is another collection that previewed at Quilt Market, so you've already seen a sneak peek, but today we're sharing it all--filling your day with adorable chickens! 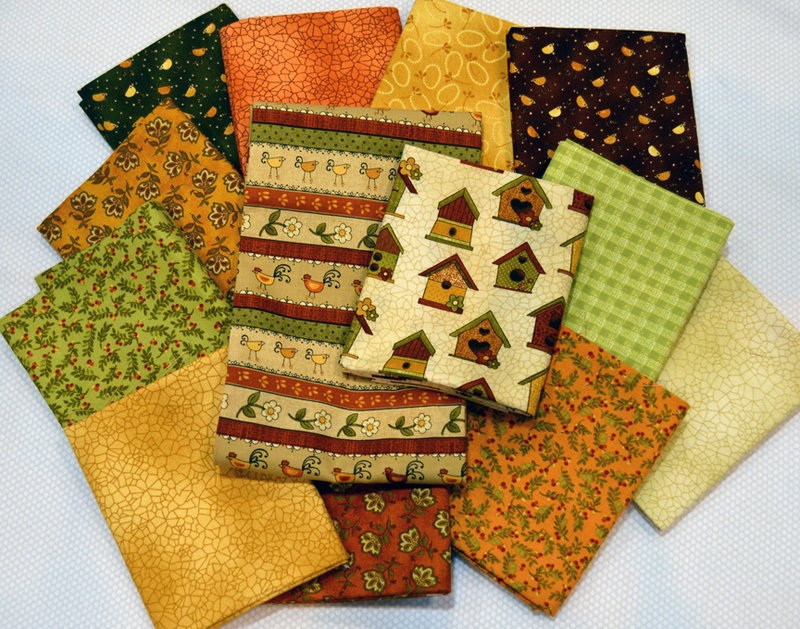 Keep reading to learn more about this collection and the fabrics in it, and then come back tomorrow for a Technique Tuesday post by Debby Kratovil featuring these fun prints! 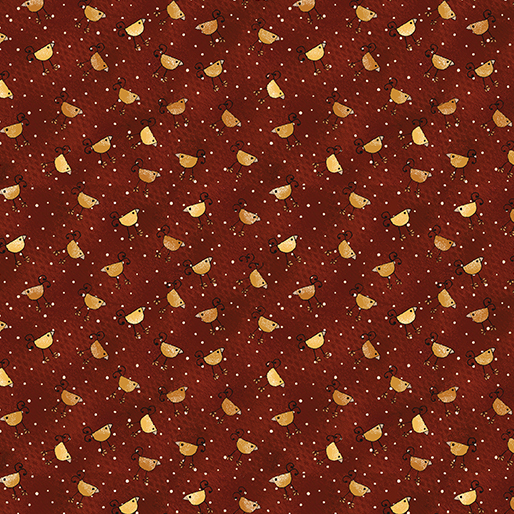 What inspired you to design a chicken-themed line? I have chicken décor in my kitchen. I was playing around, drawing some chicken designs for my own kitchen and one thing led to another. 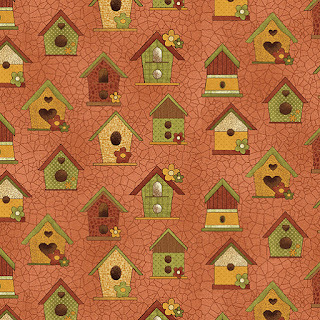 What did you pair with the chickens in the Chicks on the Run fabric? I have a yard full of birdhouses. We love our birds here—we see them all winter and enjoy the families and babies all summer. I have bird feeders and bird baths all round. 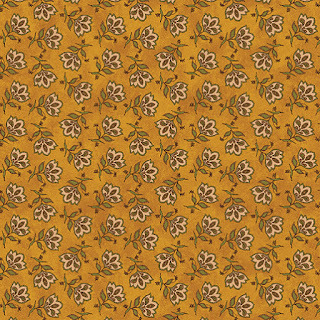 I also really like flowers, so it worked to tie these three ideas together. The chickens are definitely whimsical. I really wanted them to be fun. When I design panels, I like to have the panel contain smaller pieces that you can actually do things with. 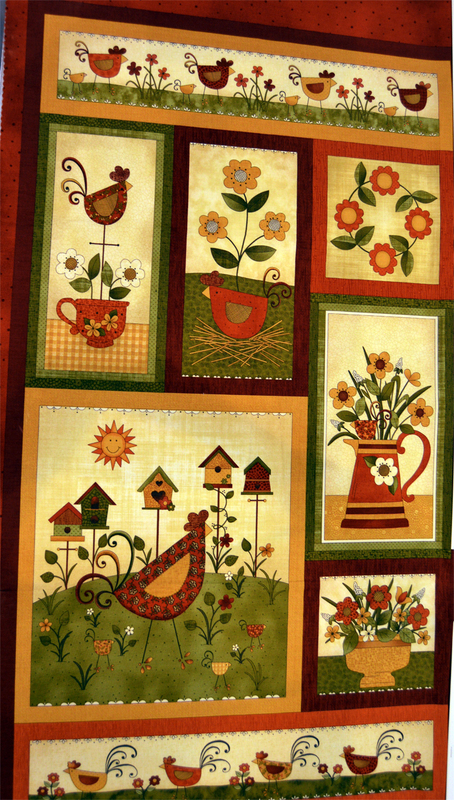 You can make table runners or potholders or small wall hangings from the different pieces. The little gold flower pot with the flowers. I really like the flowers in the fall colors. I could see it being a table mat on my counter. Let’s talk about the color palette. I’m a fall person. If I had to choose a palette as my favorite, I’d choose fall colors. 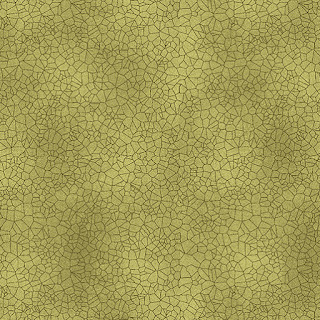 I chose orange, gold and deep red, and then added my favorite mossy green in as well. I had fun using lighter colors in this collection—I normally use a lot of darks, but these are softer. Tell us about the coordinates. 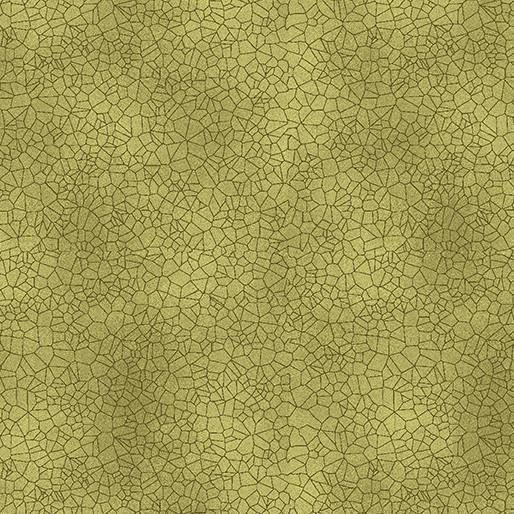 I really like the crackle print. I was thinking of cracked eggs. It makes a great blender. 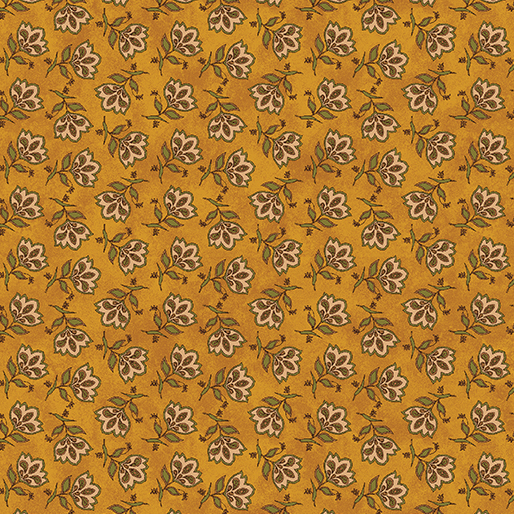 When I design, I create the panel, and then the border prints, and then I think about prints that would work for sashing, and last, the blenders. I designed the mini chicks to be used as a sashing print. 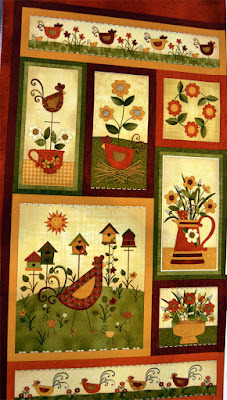 I consider the birdhouses and the chicks in cups to be border fabrics. My favorite is the tossed Jacobean flowers. I really love that print. 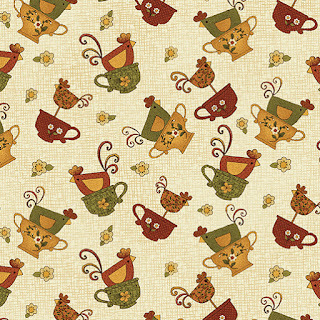 It makes such a pretty border, but it can also be used as a background or a tonal because it’s so subtle. Click here to see the entire Chicks on the Run collection. psst...we'll be showing Cheryl's quilt patterns for Chicks on the Run later this week, but you can get a sneak peek by clicking here! 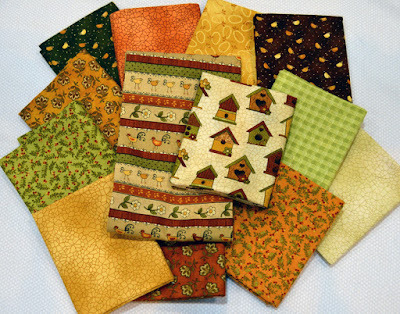 And psst...Cheryl will be demonstrating quick fuse techniques at Missouri Star Quilt Co.'s Birthday Bash September 22-24! 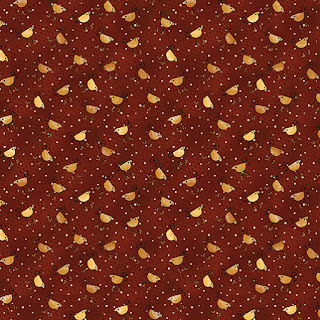 I fell in love with this fabric and bought a couple yards "just because"..... Not sure what I'll do with it but at least I got some. It's so cute!!! I love the little chicks! Really cool fabrics and panel!! I love each print in this collection. I am looking forward to her patterns. oh my - I am in love with this line!